When I first learned to knit a little less than five years ago, successfully knitting lace – in the form of scarves, shawls, stoles, etc. – was one of my personal goals. In my mind, once I knew how to knit lace, I would be on my way to becoming a true knitter. With that thought in mind I tried out many different types of lace projects: simple, complicated, little, big, and everything in between. Certainly not as numerous or as diverse as many other knitters, but my fair share for five years, I’d say. It all boils down to this: out of all the different lace projects I’ve completed, the Path of Flowers stole is one of my favorites. Melon scarf is up there, too, but that’s it for the top tier. Pattern: Path of Flowers stole by Chrissy Gardiner (on Rav). The pattern was a bit of a pain to knit at first, but the finished stole is amazing: airy, light, delicate, and divinely beautiful. Yarn: Mountain Colors Winter Lace (50% wool, 50% silk) in Mountain Twilight. I used up about 870 yards, less than 1 skein. A little more hairy than other wool/silk blends I’ve used in the past, but the color was spot on for this project – deep, slightly variegated, worked well with the pattern, and photogenic to boot :). Blocked like a champ, too. Needles: Addi Turbo circs, size US 6. Finished dimensions: after blocking, 23″ wide X 70″ long. Holy moly, this stole is gigantic! Remember how I said that the finished dimensions are the size of a human? Well, it came out even larger than that, since it blocked narrower and longer than I had estimated! But just imagine how warm and cozy it will be on chilly days (as it was the day we took these photos – I was wearing a wool sweater! In May!). In conclusion, this is one of the best I’ve made so far. It was a bit rocky at first, but at the end, everything about it made me very happy. End of story. My goodness, that is absolutely gorgeous! I have never thought to use the Path of Flowers pattern, but now that I have seen it, it will be entering the queue. I am impressed with the size as well! Ahhh! You let it touch the ground! It’s beautiful! I can see why this is your all-time favorite. Nice work, and thanks for sharing it with the rest of us. Oh, it’s just gorgeous. The center motif is my favorite–those curves! BTW, I can’t believe it’s been five years since you learned to knit! I’ve been a fan of yours since the beginning and love the scientific perspective you bring to things. Keep up the fantastic work! Mazal tov! It’s a wonder. Wear it with joy and in good health! WoW! This one is absolutely gorgeous. Thanks for sharing. I’m sure it does make you so happy. That’s just stunning. I wish it were easier to find her patterns. Something along the lines of paying for a download? I am so blown away, as usual, by your knitting! But this is definitely something special. I think the combination of yarn, color, and pattern are just perfection! WOW. I HAVE TO MAKE THIS. These photos (and the subject of the photos) are stunning Kathy! Yowza! 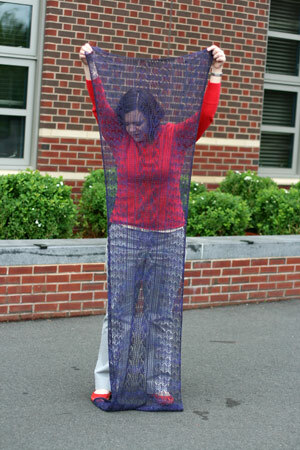 That’s a shawl! Beautiful—and I love the colorway. I’ll have to look into both the pattern and the yarn. I can see why it’s your favorite. It is beautiful! I can’t believe you let it touch the sidewalk. This is a gorgeous and impressive piece of lace. I’m so glad to see you enjoying it. 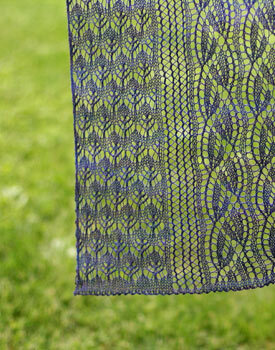 You mention this shawl being in your top 10 favourite knits, and I agree with you! It is beautiful! I wonder if you would like to do a post on that, your top 10 list? I would love to see it! stunning! as i said in a previous comment – i had no interest in this stole…but your ‘to-die’ for version has convinced me otherwise. Stunning! That looks wonderful. And marvellously blocked, too! 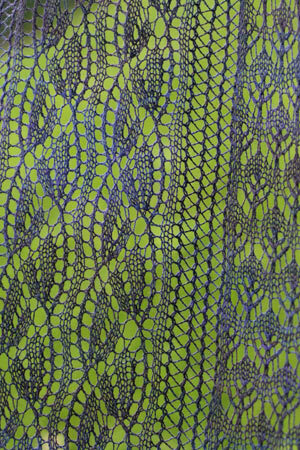 Lace takes extra care in the beginning and I usually find it best to start a couple of times to find my footing. A shawl might get off to a bad start but it is so worth persevering and going the distance. This shawl is stunning!! lovely!! i really love the color. beautiful work! Gorgeous! I love the way the side panel looks like peacock feathers. You have this amazing ability to make me covet patterns I hadn’t looked at twice. You’ve done it again — this is GORGEOUS! i was wondering, i’ve never knitted lace, so is it warm ? Gorgeous shawl. It looks like a great pattern. Beautiful! I have a skien of that yarn on hand, and I’ve been trying to decide what to do with it. Oh my, that is gorgeous. just lovely. i want one too. Absolutely positively beautiful. Good job. It is stunning! and huge! That is stunning! I love the organic shapes with the honeycomb like mesh. A wonderful piece. I don’t think I’ve ever blocked out any of my lace pieces to be that airy, but I really like the look each time I see it. 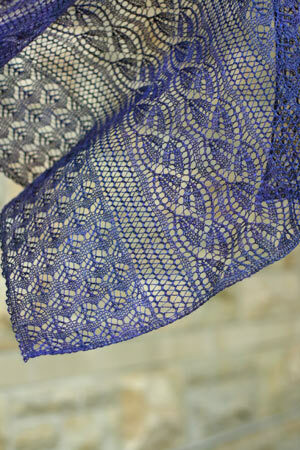 I really need to remember to monster block my next lace shawl! I’ve been reading your blog for a while. change things to suit yourself. Good heavens, that is beautiful! I love the center motif so much – Chrissy Gardiner’s lace patterns just make me salivate. Your color choice is lovely, and the end result is just perfect! Damn girl this is byoo-tee-full and complicated looking! It would be one of my fave projects as well. THat is just gorgeous! Wow wow wow! Wow! And just 870 yards? How lovely this is! I can see why it is your favorite; linear and curved, simple and complex. This one is definitely going into the queue. Absolutely beautiful lace!! I made much the same committment after seeing lace knitting for the first time a few years ago. Again, gorgeous. This is georgeous. Wow ! It’s lovely! The color is beautiful! Wow! I can see why this is a favorite! It’s beautiful. Well done! I still can’t believe you’ve only been knitting for 5 years!! Wow, super gorgeous!! How does the edges look? Would love a close-up of that. Oooh, gorgeous. 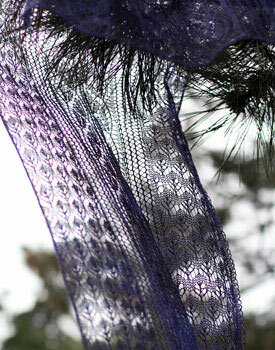 I have some yummy Sundara lace that I need to find a project for and this just might fit the bill. You’re always such an inspiration to me. Wow! It’s stunning! The slight variegation is beautiful. Really love that lace pattern, too. Absolutely going in my queue. Have fun wrapping up in that. Count me jealous! So beautiful….and straight in to my queue. I’ve been ogling many lace patterns recently, trying to find the perfect ones for 2 beautiful silk lace yarns I have in my stash. Gorgeous knitting, of course, but your shoes are fabulous too!